Gartner this week lowered its growth forecast for worldwide PC shipments in 2011, joining a growing number of analysts who believe Apple’s iPad 2 will bridge the remaining gap between laptops and tablets this year. The research firm said that worldwide PC shipments will grow at a slower-than-expected rate as users opt for a wider variety of “PC alternatives” such as the iPad to meet their computing needs. Gartner is forecasting PC shipments to total 387.8 million units this year, growing by 10.5 percent compared to 2010. Gartner previously projected 15.9 percent growth for this year. “We expect growing consumer enthusiasm for mobile PC alternatives, such as the iPad and other media tablets, to dramatically slow home mobile PC sales, especially in mature markets,” said George Shiffler, research director at Gartner, in a statement. The forecast update comes just a day after Apple launched iPad 2, the successor to the wildly successful iPad, which started shipping about a year ago. By the end of 2010, iPad shipments totaled around 15 million units, with the popularity of the tablet sparking discussion that the market is entering a post-PC era where tablets will increasingly be the focus. The iPad 2 contains a dual-core A5 processor running at 1GHz, and provides twice the processing power and nine times better graphics than its predecessor. The new tablet is able to play back 1080p high-definition video, a task many netbooks and entry-level laptops and PCs still struggle with. Netbook shipments are already getting clobbered by tablets, with both devices competing for consumer dollars. The iPad 2 could also bite into Apple’s Mac and iPhone shipments, and both product lines are potentially at risk, wrote financial analyst Brian Marshall of Gleacher and Company, in a research note on Thursday. “The iPad has successfully integrated the functionality of a slimmed down notebook into a media player form factor and has effectively rendered a ... portion of the Mac (and potentially the iPhone) product family obsolete,” Marshall wrote. iPhones and Macs generated 64 percent of Apple's total revenue in calendar year 2010, Marshall wrote. Of course, the original iPad hasn’t exactly hurt Mac and iPhone shipments. During its fiscal first quarter of 2011, Apple sold 7.33 million iPads, nearly matching the total number of tablets it sold during the entire 2010 fiscal year. Still, Apple enjoyed record Mac sales during the fiscal first quarter and saw iPhone sales jump 86 percent from the same period a year ago. “If this is cannibalization, it feels pretty good,” Apple chief operating officer Tim Cook told analysts in January, when asked if iPads were eating into Mac sales. The post-PC theme was evoked by Forrester Research analyst Sarah Rotman Epps, who in a Wednesday blog entry, said that iPad 2 would help Apple get 80 percent share of the U.S. tablet market in 2011. Epps projected 24 million tablet sales in the U.S. this year. Stifel financial analyst Doug Reid is projecting worldwide tablet shipments to reach 58 million units this year. Apple will achieve 53 percent market share in 2011, compared to the 94 percent share it had last year. “We expect demand for Flash, 4G, and Android-based tablets and aggressive price competition from ... competitors (Samsung, LG, HTC) to drive [Apple] market share lower,” Reid wrote in a research note. 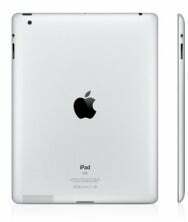 Apple’s iPad faces competition from tablets due out this year running Google's Android 3.0. Motorola last month started shipping the Xoom, the first tablet available with Android 3.0. Hewlett-Packard, Research In Motion and Dell are among the companies that will ship tablets later this year. Besides tablets, smartphones such as Motorola’s Atrix 4G are also being pitched as alternatives to PCs. The Atrix , which runs on a dual-core ARM processor, could be plugged into a dock with an 11.6-inch screen and keyboard to give laptop-like functionality to the smartphone.